There is probably no need to introduce Weleda. The Swiss cosmetic and pharmaceutical brand has been in the market since 1921. And although they have no “bio” label on their products it’s hard to find more organic cosmetics than theirs. Just for the record: Weleda was founded by Rudolf Steiner who developed anthroposophic medicine as “consciousness of one’s humanity” and as part of his larger conception of life called anthroposophy. Weleda produces all its products according to those principles much tougher than any French “organic” label. But don’t worry, you don’t need to be a follower of Steiner or his theories to appreciate the treats at Espace Weleda. You walk into the place and you get the impression that you're entering an oasis of peace and tranquillity. 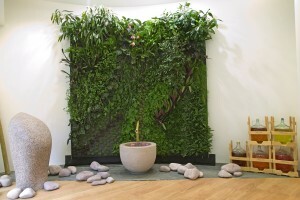 There is a green wall of plants, designed by famous garden architect Patrick Blanc. The British architect Maryam Ashford-Brown designed the whole space. She used a lot of natural stone, granite and oak to mix it all up with the flashy colours of the Weleda products themselves. Full body massages, (1h15, 95 €) hand massages (20 minutes, 29 €) or face treatments (45 minutes, 65 €) are offered within the three treatment rooms that are all a bit different. The funny thing is: here you are not bothered by that kind of relaxing music that only gets on your nerves, often. You are supposed to listen to your breath, which is finally much more reposing. And in case you would like to go deeper: a kinesiotherapist holds workshops to teach people infant massage, breast massage or hand massage. Today Chiara was showing us how to give a hand massage to family members, friends or your own children to help them relax. If you’ve done it once, read my lips, your kids will not ask for sweets anymore, they will much more often demand a massage.